61 Ballast Point Drive Manteo, NC. 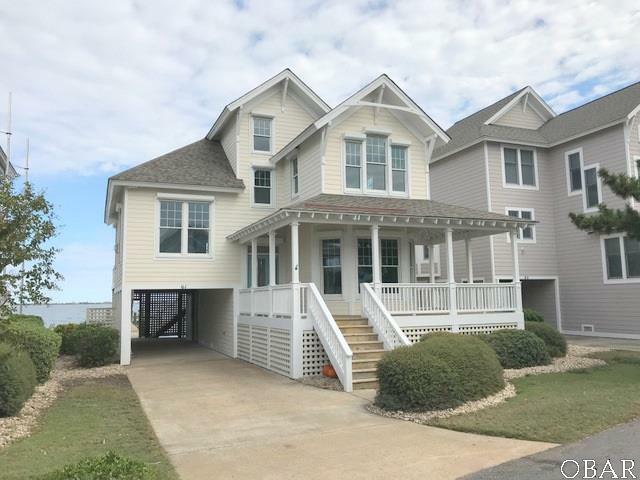 | MLS# 103567 | Outer Banks Homes For Sale, North Carolina Home Search Including Nags Head, Pirates Cove, Manteo, Kill Devil Hills Kitty Hawk, Southern Shores, Duck, and Corolla North Carolina, Oceanfront and Soundfront properties for sale and long term rentals. This recently remodeled home has a beautiful soundfront setting! This 4 bedroom, 3 bath home has incredible views and is located in the World Class Boating Community of Pirate's Cove that offers just about any amenity a home owner or vacationer could dream of! All renovations and all new major systems replaced in 2018. Brand new bulkhead and huge boat dock with lighting, electric and water. Beautiful new 100% WATERPROOF flooring thru out. This brand new kitchen boasts all GE Stainless appliances, Granite countertops, oversized island, and Krafsmaid soft-close cabinets! EVERY door and window has its very own Hurricane shutter. Enjoy the sound views from your private, large master suite with a huge walk-in closet. End your day enjoying a bath in the free standing tub or the gorgeous new oversized, porcelain tiled shower. Too many upgrades to mention here. Full list of improvements in Associated Documents.